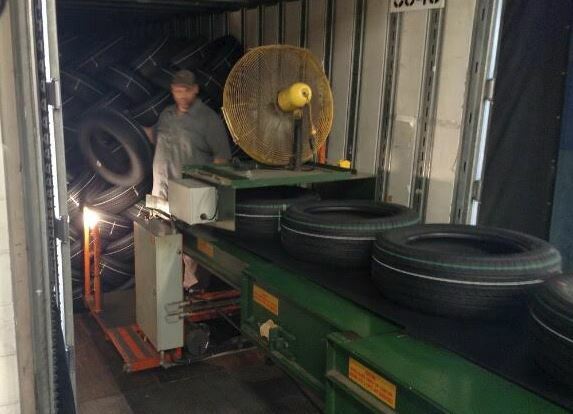 These areas are frequently handled manually, with some companies hand carrying finished goods out to the trailer. Others palletize them and move the pallets out with forklifts or pallet jacks. Others have used carts. These are all viable solutions depending on the situation and order volume, but if you don’t need to clear the area for staging, receiving or assembly, a good option would be to have fixed assets like conveyors installed. If you must clear the area, then retractable conveyors may provide the best of both worlds. These extendable conveyors are installed in a loading dock area. They are ideal for managing automation all the way from the first moment you scan a pick ticket until a box is unloaded from the back of a trailer. Aside from speeding the loading process, this is safer and easier on the backs of warehouse workers who load the truck. These systems tie directly to conveyor systems and can be driven by warehouse control systems and other automated software. These conveyors can be rolled out of the way when you’re not using them, allowing you to clear the area for staging or temporary storage. This Adjustoveyor video illustrates the functionality of extendable systems for unloading a truck of cartons or other cubed loads. Above: video for drive-out roller systems. These systems extend from a permanent conveyor system into a trailer. Since they’re powered, they don’t require any effort from warehouse workers to extend and maneuver into the truck. They come in both belt and roller models, which allows more load type flexibility. Both types are easily steered with a joystick. Belt systems can accommodate many load types, while rollers are ideal for packages and heavy-duty loads. They come in widths of 35-3/8″ or 39-1/2″ with belt widths of 24″ or 30″. Lengths range from 38′ to 65′ with a fixed belt height of 38-1/2″ . These are of course the standard sizes; you can get most anything built to specific application needs. These conveyors can float across multiple dock doors. Good for loads up to 50 pounds per foot, or a thousand pounds total live load. With an optional indexing optic package, you can use extendable belt systems as an end-of-line buffer. They run until the front edge of the load is detected, and stop for a predetermined time. Extendable roll-out systems have heavier capacities than their belt counterparts, with 100 pounds per foot. It handles the tougher, heavier loads, or areas with higher-impact loading or multiple work shifts. Serves 53′ trailers, and allows operators to “float” across multiple dock doors. These conveyors utilize standard 1.9″ rollers with 3″ axle centers (you can optionally specify 4-1/2″ centers for larger packages). Widths: 33.5″ frame, 29″ roller. Lengths range from 73′ to 62′. Other lengths can be constructed on request. One of the primary uses for flexible conveyors is to interface with trucks. That can be a truck at a dock, in a yard or elsewhere, but a docked truck is probably the most common application. In lower volume backrooms (such as retail stores or smaller warehouses), portable gravity conveyors are ideal, since they can be rolled over to a dock door and extend inside to unload or load. The key is that they are versatile, and can be retracted then stowed away to save space when you don’t need them. Since they aren’t connected to power, they are instantly portable and can be rolled by one person to a waiting truck or dock door. Flexible skatewheel conveyors are ideal for loads with consistent, smooth bottoms. This means totes, new cartons of adequate size, and other consistent loads. Flexible roller conveyors offer full-width rollers for packages or loads that won’t flow on skatwheels. They’re available in standard widths of 18″, 24″ and 30″, with variable lengths ranging from 2’8″ to over forty feet at maximum extension. For vans and delivery vehicles, fold-up conveyors that can either be stored at the dock area or carried by the vehicle are a good option. Power systems are frequently used to feed waiting trucks in distribution operations. Although they must be powered, they are still portable and provide the versatility to serve multiple dock doors simultaneously if needed. When you have to bridge the gap between your warehousing operations and a trailer, there are many options. Many companies palletize everything and simply forklift them into the trucks, but this can be slower and less space-efficient. Conveyors are almost always the best option for medium and high-volume operations.